Legs are starting to come back …. As I mentioned in my previous post, I have been running without using my watch for close to a month now. The lack of analyzing every run, every mile split and fixating on pace vs. effort has been just what I needed to get back to basics and recharge the batteries with a very challenging Austin Marathon training Cycle ready to kick-off in 33 days. (But whose counting). This morning I woke up at 4:30 a.m. local time in Toronto, Ontario. A city that I am slowly becoming more familiar with as I will be traveling here for work quite a bit over the next 11-12 months. I had 8 miles on the schedule and wanted to keep it as uncomplicated as possible. I decided to run 4 miles uphill on Yonge Street at a moderate pace, then turn around and run downhill back to my hotel on lower Yonge. I strapped on my Garmin for the first time in quite awhile, started the clock and then switched the mode to Time of Day. I would not see my pace as I ran, but each mile would beep gently to let me know that after 4 beeps it would be time to turn around and head back to the hotel. The first 4 miles were relatively uneventful. I was hoping for cool temperatures, but alas, it was another #shirtless run in 70 degree heat with 80% humidity after last night’s rain. I climbed up Yonge for what seemed to be about 300-400 feet of climbing before the turnaround and fell into a comfortable pace. As I heard the fourth beep, I crossed the street to face oncoming traffic as usual as a safety measure and headed back toward the Marriott. It was 5:20 a.m. or so at this point and I started to see quite a few runners up and down Yonge Street, so it seemed like I picked a popular route. As I made my way back toward the hotel with about 3 miles to go I pulled alongside a younger runner and gave him a nod as I went past. I could sense that he was not thrilled with an old-guy like me sliding past him in the morning and he fell in off of my shoulder running about :15 seconds per mile faster than he had been going. Normally I do my own thing out on the trail and do not get caught up with anyone else is doing during training runs. What is an easy day for me might be an interval day for someone else. Or vice-versa. I may be on mile 5 or 6, while they are running a cool-down after a workout, or perhaps they are now starting a tempo run. You just never know. The other reason I do not get caught up normally with such things is I train in order to race. 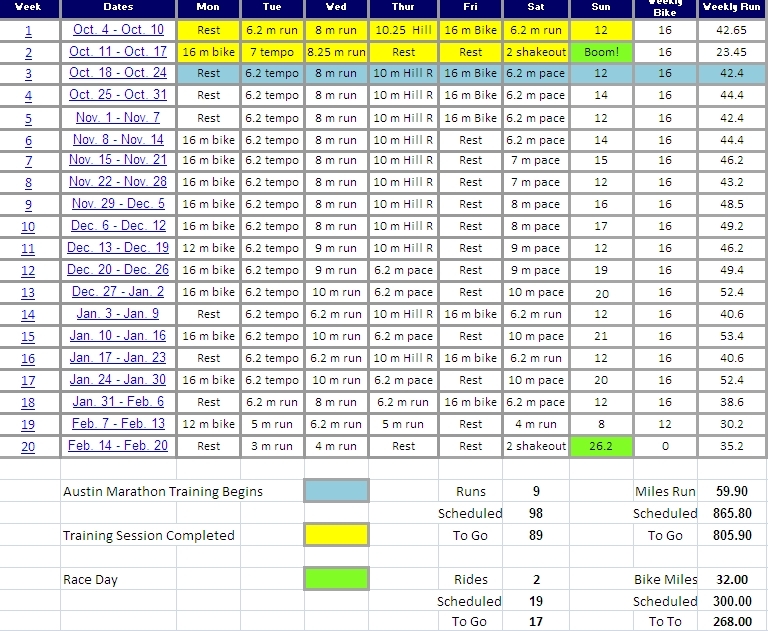 I do not “race” my training plan. The next time I am concerned with how fast I’m running will be on Thanksgiving morning at the Turkey Trot or in January at the 3M half-marathon tuning up for the Austin Marathon on Feb. 15th. But as I heard the footsteps quicken beside me, I decided to have a little fun to see how long this young man wanted to hang with me and how much he was willing to hurt to do so. With a rest day on deck tomorrow, I decided to gradually wind the watch to see how our return to strictly running after Ironman Texas was paying off. I reached down and switched the watch from time of day over to satellite tracking. We were moving along at 7:20/mi pace. 7:10, 7:05, 6:55, 6:45 and finally when the final mile to the hotel beeped I was down at 6:37 pace and the footsteps behind me had gone quiet. As I cooled down before walking back into the hotel lobby to get on with my day I have to admit I was a little embarrassed that I let that competitive side of me, normally reserved for race day to bubble up to the service. I should have been smarter and more mature than to get caught up in such things during my pre-training phase. That said, it felt a helluva lot better than had I not been able to drop him. The legs are returning. When the cool fall temperatures arrive in Austin, we’re going to be ready.